Bring smile among all needy children !! Festival and street children India !! SMILE,India workcamp and spl’ camp details ! Urgent volunteer places open India !! Smile Society(ngo) welcome youth!! This entry was posted in Volunteering India. Hello friends! Any #group planning to visit India this #summer? Join Street Angels #international #Workcamp at #SMILE #NGO #India . Coming #workcamps in May & June during 1-14th & 17-30th have open places!! Many projects round the year also available!! Apply soon to be part of #SMILE #mission to bring smile around. Do you like to help SMILE NGO to bring a smile to the most neglected children living on the street of kolkata ,India.This project is all about bringing smile to all underprivileged refugee children & their mother from the street of kolkata.Providing informal basic education like english teaching ,hygiene,basic health care,family planning education,playing, organising entertainment program ,food distribution for these children of this downtrodden community would be the main target of the volunteers in this camp. SMILE Society ( Situational Management & Inter Learning Establishment Society) is a registered Non profit working for these underprivileged communities around the state of West Bengal since 2003 . SMILE Society made to fight against this injustice and bring a smile to these cute faces.Since then SMILE brought hundreds of children from the street to the normal society . SMILE mission is to provide volunteers with a customised program (workcamp, short term, long term) that will enable them to make an important contribution to these poor and needy kids from the street. Our foremost goal is to “Bring Smile around” We ensure that all volunteers are provided with a safe and enriching experience. Our flexible approach means that you will be given a placement to suit your needs and time scale. All international students are also welcome to take part in our Programme. Our unique placements could become the trip of a lifetime. Target Group for these camps:- Helping Children and their mother/sister from the street( mostly refugees) of India to get basic education,vocational and hygienic training etc. Daily more than 100 families receives support at our different centres around. Project Back ground :- India having uncountable numbers of street and slum dwellers . There are thousands of poor refugees coming every year from nearby countries and from different small towns and villages to the big cities and most of these families are living in a very poorly condition at slums or on street corners like insects. Normal societies are so busy to deal with their personal daily problems, so have little time for these unfortunate people. With every such family Grownup girls and married women (mother of the children) always have to face the problem in their daily life. Often these families bring their children to help them in begging ,household work ,rag picking activities, even some girls been forcibly thrown to the dark life of prostitution. So it is really a shame of the so called civilised societies. We have got our few projects for these unfortunate street children at the different locations of big cities. Now there are opportunities available to help and support these unfortunate girls and mothers of the street children in and around Kolkata (ccu) city.our target to bring smile on ever mother too with their children.Kolkata ,the city of joy was known before as Calcutta since the colonial time. This ancient city was used to be the capital of British colonial period. This city has full of heart ,people are basically belongs to the middle class . There are also rich and poor people all around . City Kolkata is know for its busy traffic ,huge population ,warm welcome and poverty around the street corners! It is a great place to visit for every tourist coming to India. Work & Activities :- Most important target of the project is to bring smile among these children and provide confidence and moral support to their mother .Volunteer would use different way of informal education technique to present a unique and attractive way of education programs for these kids .Most of these kids speaks local Bengali /Hindi language but they are very smart and intelligent.so teaching them with the support of local coordinator would not be so difficult ,just little bit of patience and involvement can solve this problem easily. All volunteers would go through orientation on arrival and two local language session during this camp. There would also be a workshop every evening when volunteers would prepare the next day lesson plan of action . For mothers informal vocational training and basic English teaching would be helpful . Volunteers would also help local coordinator in other activities like giving shower food distribution, organising drama,story telling and entertainment games for the children.whole camp would be run under the supervision of very experienced local project coordinator. Saturday and Sunday would be free days when volunteers can take rest or tour around the city or near by places.More over if anyone get a chance to live with the local host family then that brings extra bonus to any traveller .It helps to learn the culture ,tradition,language while staying within the normal people of the society.Living on any hotel can never give any traveller such wide scope to know the society and communities as a whole. SMILE society always tries to give international volunteers a big scope to know about the local communities and understand the family environment. Smile Society (ngo) had started their activities since 2003 ! Project hour : As per project In charge. After 8 pm exit door would be closed.No one allowed to go out or come in the accommodation after 8 pm everyday including weekends. Do you love dogs & cats? Then this camp is for you.This camp is for bringing welfare service to one of the most neglected domestic animals like dogs and cats in India. SMILE Animal shelter for Domestic Animal welfare project providing shelter to dogs and cats.Volunteers would have amazing time with these cute animal for sure. .SMILE believes in family type of environment. Our mission is to provide volunteers with a customised program (workcamp, short term, long term) that will enable them to make an important contribution to the poor and needy kids of India. In the past several years, we have placed many volunteers around various parts of India within different projects. Our foremost goal is to “Bring Smile around” We ensure that all volunteers are provided with a safe and enriching experience. Our flexible approach means that you will be given a placement to suit your needs and time scale. There are many other attractions as well. Our unique placements could become the trip of a lifetime. Target :- Welfare activities like food distribution,health care,grooming to cats and dogs from SMILE NGO Domestic Animal Shelter. In India dogs and cats are every where on the street living under unprotected and abandoned life . In SMILE family we have a big love for domestic animals basically dogs,cats and so we made a small shelter in 2009 where we take care of few dogs and cats on regular basis. There are huge number of street dogs and cats who are roaming unprotected and struggling for the life and shelter.There are almost no management system from local government available for these animal.There are long and short term volunteering opportunities available every year for these poor needy animals. Activities:- Volunteers job are mostly food preparation,distribution,grooming,shelter cleaning ,taking care of dogs and cats at our shelter. We welcome international individuals or groups to help and look after these domestic animals during the camp. It is a fun filled experience for volunteers!! All volunteers taking this project should take anti rabies vaccination before joining these camps.International youth have chance to experience this unique project ,can help local member in different activities .They can have a change to enjoy with these cute animals. Mainly this projects are those who care about dogs and cats. 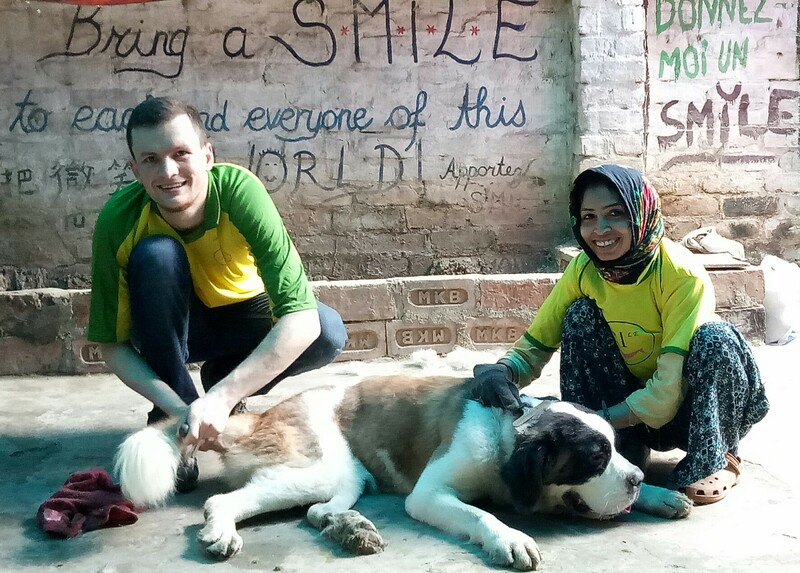 If you love dogs and cats then this project would give you satisfaction and valuable knowledge .Volunteers also can experience the Indian food and culture while living at local host family. There would be local language classes and cooking training given . Experiencing India in different shades . This project is based at SMILE head office near Madhyamgram town (8 km from Kolkata Airport and 22km from City center. You can find more details about the location on wiki link: https://en.m.wikipedia.org/wiki/Madhyamgram. Do you like to help SMILE NGO to bring a smile to the most neglected children living on the street of kolkata ,India.This project is all about bringing smile to all underprivileged refugee children & their mother from the street of kolkata.Providing informal basic education like english teaching ,hygiene,basic health care,family planning education,playing, organising entertainment program ,food distribution for these children of this downtrodden community would be the main target of the volunteers in this camp. SMILE Society ( Situational Management & Inter Learning Establishment Society) is a registered Non profit working for these underprivileged communities around the state of West Bengal since 2003 . SMILE brought hundreds of children from the street to the normal society . SMILE mission is to provide volunteers with a customised program (workcamp, short term, long term) that will enable them to make an important contribution to these poor and needy kids from the street. Our foremost goal is to “Bring Smile around” We ensure that all volunteers are provided with a safe and enriching experience. Our flexible approach means that you will be given a placement to suit your needs and time scale. All international students are also welcome to take part in our Programme. Our unique placements could become the trip of a lifetime. Target Group for these camps:- Helping Children and their mother/sister from the street( mostly refugees) of India to get basic education,vocational and hygienic training etc. Daily more than 100 families receives support at our different centres around. Project Back ground :- India having uncountable numbers of street and slum dwellers . There are thousands of poor refugees coming every year from nearby countries and from different small towns and villages to the big cities and most of these families are living in a very poorly condition at slums or on street corners like insects. Normal societies are so busy to deal with their personal daily problems, so have little time for these unfortunate people. With every such family Grownup girls and married women (mother of the children) always have to face the problem in their daily life. Often these families bring their children to help them in begging ,household work ,rag picking activities, even some girls been forcibly thrown to the dark life of prostitution. So it is really a shame of the so called civilised societies. We have got our few projects for these unfortunate street children at the different locations of big cities. Now there are opportunities available to help and support these unfortunate girls and mothers of the street children in and around Kolkata (ccu) city.our target to bring smile on ever mother too with their children.Kolkata ,the city of joy was known before as Calcutta since the colonial time. This ancient city was used to be the capital of British colonial period. This city has full of heart ,people are basically belongs to the middle class . There are also rich and poor people all around . City Kolkata is know for its busy traffic ,huge population ,warm welcome and poverty around the street corners! It is a great place to visit for every tourist coming to India. Work & Activities :- Most important target of the project is to bring smile among these children and provide confidence and moral support to their mother .Volunteer would use different way of informal education technique to present a unique and attractive way of education programs for these kids .Most of these kids speaks local Bengali /Hindi language but they are very smart and intelligent.so teaching them with the support of local coordinator would not be so difficult ,just little bit of patience and involvement can solve this problem easily. All volunteers would go through orientation on arrival and two local language session during this camp. There would also be a workshop every evening when volunteers would prepare the next day lesson plan of action . For mothers informal vocational training and basic English teaching would be helpful . Volunteers would also help local coordinator in other activities like giving shower food distribution, organising drama,story telling and entertainment games for the children.whole camp would be run under the supervision of very experienced local project coordinator. Saturday and Sunday would be free days when volunteers can take rest or tour around the city or near by places.More over if anyone get a chance to live with the local host family then that brings extra bonus to any traveller .It helps to learn the culture ,tradition,language while staying within the normal people of the society.Living on any hotel can never give any traveller such wide scope to know the society and communities as a whole. SMILE society always tries to give international volunteers a big scope to know about the local communities and understand the family environment. Smile Society (ngo) had started their activities since 2003 ! An international platform to exchange culture and language is the main aim of this camp.SMILE Society ( Situational Management & Inter Learning Establishment Society) is a registered NGO & NPO working in the field of International volunteering. SMILE believes in family type of environment. Our mission is to provide volunteers with a customised program (workcamp, short term, long term) that will enable them to make an important contribution to the poor and needy kids of India. In the past several years, we have placed many volunteers around various parts of India within different projects. Our foremost goal is to “Bring Smile around” We ensure that all volunteers are provided with a safe and enriching experience. Our flexible approach means that you will be given a placement to suit your needs and time scale. All international students are also welcome to take part in our projects. Our unique placements could become the trip of a lifetime. Target :- Energetic youth from round the world gathered together to learn Indian culture ,food ,yoga and bring friendship and learn each other culture. India is always been famous for its culture ,tradition,language and food cuisine . Different culture ,dress code ,language and cooking style made the country like a continent ! While volunteering in this camps youth can have chance to interact with the East Indian ( Bengali ) culture and food . Volunteers and local family together exchange the culture and cook food . Volunteers would have a chance to learn Indian yoga & meditation basic lesion in this camp.Youth volunteers have golden chance to know about the ethnic heritage of East Indian cuisine and tradition . It would a great fun filled time for groups. In this camp volunteers from round the world would have chance to exchange culture,language,food etc. Special attraction for this camp would be Yoga & Meditation lesson , local cooking lesson, local language class. It would be fun fill entertainment camp where Indian family and international youth can have a platform to each other culture and life style. Camp would take place in the suburb call Madhyamgram which is just 8 km from Kolkata Airport .Transportation, electricity,shopping places are all around.Nearest rail and bus station is with in 2 km .Life is very simple and peaceful around. Organic farming in urban areas through Green House and alternative methods are the main aim of the camp. International youth have chance to work together with SMILE local volunteers in the project.A complete cultural exchange platform would be there while working in a family type environment. SMILE Society ( Situational Management & Inter Learning Establishment Society) is a registered NGO & NPO working in the field of International volunteering from India. SMILE believes in family type of environment. Our mission is to provide volunteers with a customised program (workcamp, short term, long term) that will enable them to make an important contribution to the poor and needy kids of India. In the past several years, we have placed many volunteers around various parts of India within different projects. SMILE foremost goal is to “Bring Smile around” We ensure that all volunteers are provided with a safe and enriching experience. Our flexible approach means that you will be given a placement to suit your needs and time scale. All international students are also welcome to take part in our Internship Programme. Our unique placements could become the trip of a lifetime. Target :- Encourage Urban organic farming among city dwellers and training youth volunteers . Exciting workcamps at Smile ,India !! Save the mother planet !! !Green House construction project in support of Rain water harvesting to grow vegetable for our street children everyday food requirement and to aware city dwellers how to grow vegetable even living in small apartment or lawn or even on the roof!! Recently we just completed the first phase of Rain water harvesting project where Rain water being stored for further use. Now we are going to start Roof top Green House project at our Building to Grow vegetables to help daily need of our Children at different projects . Group with motivated youth are welcome !! First we will construct the Green House and go for plantation there after. This project can help to grow organic vegetable and fruit . lets help us to bring revolution in horticulture and floriculture at our place . 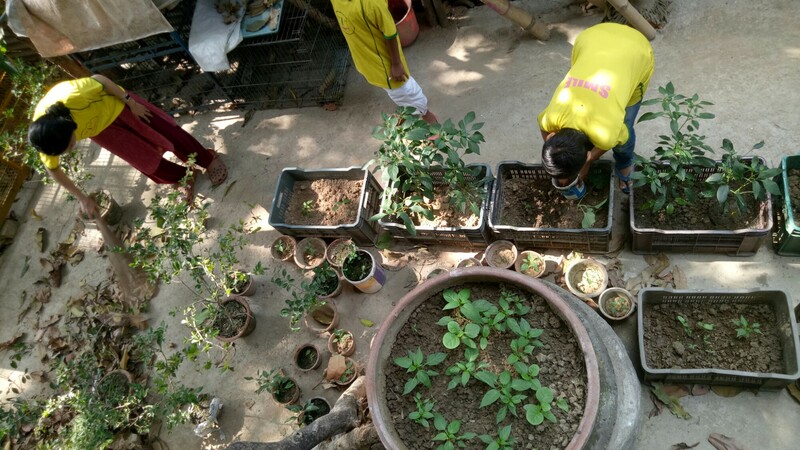 International volunteer would have learn how to grow vegetable in urban area where open space not available.Through organic way of green house farming how farming can be possible in backyard /roof/lawn or any other place available in any urban house . This project could resolve the food problem among urban based poor and lower middle class people. Even a person living on street can grow enough vegetable for him . Even this project can bring down environmental pollution level in cities if we can spread it around . There would be painting activities as well as cultural exchange programme as well !! Energetic youth group required. Your volunteers as individuals or groups welcome . 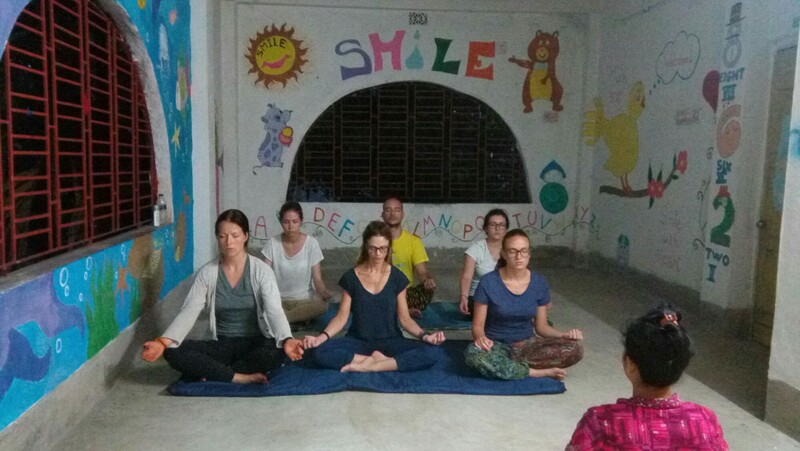 An international platform to learn yoga and Meditation while exchanging culture and language is the main theme of this camp.SMILE Society ( Situational Management & Inter Learning Establishment Society) is a registered NGO & NPO working in the field of International volunteering. SMILE believes in family type of environment. Our mission is to provide volunteers with a customised program (workcamp, short term, long term) that will enable them to make an important contribution to the poor and needy kids of India. In the past several years, we have placed many volunteers around various parts of India within different projects.Our foremost goal is to “Bring Smile around” We ensure that all volunteers are provided with a safe and enriching experience. Our flexible approach means that you will be given a placement to suit your needs and time scale. All international students are also welcome to take part in our projects. Our unique placements could become the trip of a lifetime. Target :- Energetic youth from round the world gathered together to learn Indian culture ,yoga ,Meditation enlightened and learn each other culture. India is always been famous for its culture ,tradition,language . Different culture ,dress code ,language life style made the country like a continent ! While volunteering in this project youth can have chance to interact with Indian culture and yoga/Meditation . 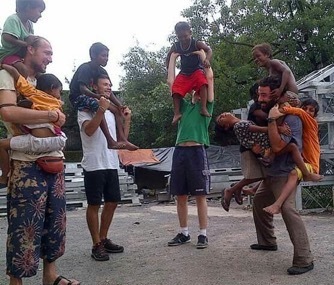 Volunteers and local family together exchange the culture . 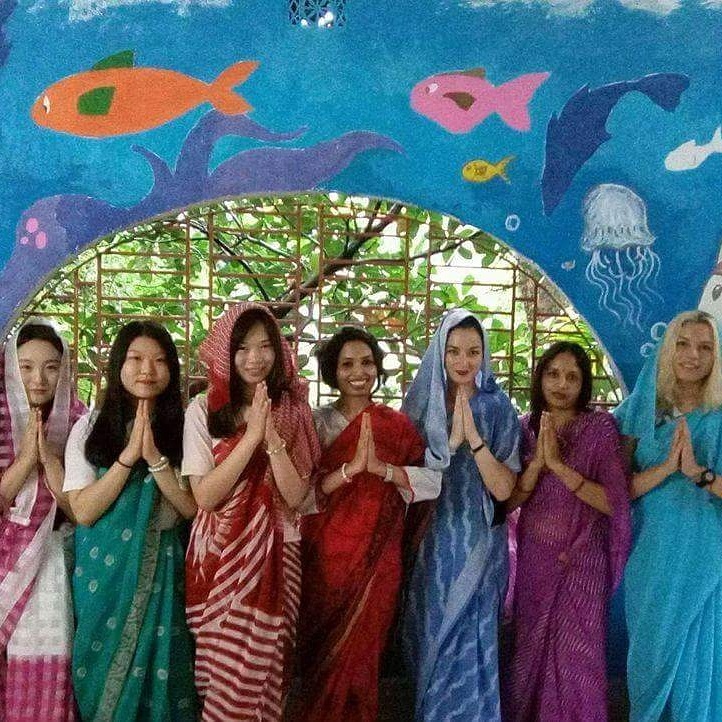 Youth volunteers have golden chance to know about the ethnic heritage of East Indian tradition . It would a great fun filled time for groups. In this camp volunteers from round the world would have chance to exchange culture,language etc. Yoga and meditation class, local language class. It would be fun fill entertainment camp where Indian family and international youth can have a platform to each other culture and life style. Camp would take place in the suburb call Madhyamgram which is just 8 km from Kolkata Airport .Transportation, electricity,shopping places are all around.Nearest rail and bus station is with in 2 km .Life is very simple and peaceful around. An international platform to exchange culture and language and help SMILE in building it’s dream project is the main theme of this camp.SMILE Society ( Situational Management & Inter Learning Establishment Society) is a registered NGO & NPO working in the field of International volunteering. .Our foremost goal is to “Bring Smile around” We ensure that all volunteers are provided with a safe and enriching experience. Our flexible approach means that you will be given a placement to suit your needs and time scale. All international students are also welcome to take part in our projects. Our unique placements could become the trip of a lifetime. SMILE always believes in family type of environment !! Organisation always trying bring all Volunteers living at the same city can have a chance to live together with the local volunteers as a big family . So this year we are expecting to start such place with the help of our host families. So we are in need of volunteers in group to help in painting and construction our dream place which is known as volunteer shelter. simultaneously our sincere effort to have animal shelter,vocational training shelter, rain water reserver to store rain water for further uses. So our Renovation and painting project has a great importance on our different projects . We are trying to bring different activities at one place . Such shelter would be our base point to bring help around . Presently shelter is going on under the observation and guidance of local host family . We welcome young energetic hard working international volunteers to participate in our RENO camps ! We also welcome groups to come and help us in construction and painting !! So for those who want to spend an exciting volunteer activities ! Please join this camps !! Participation Cost: Varies. Please contact our office. 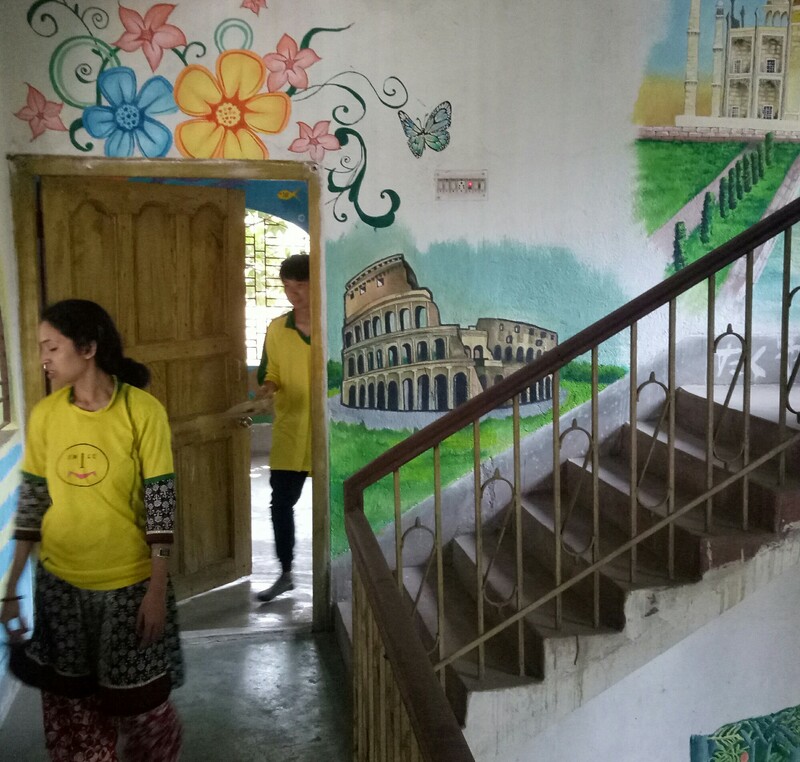 Accommodation: Dormitory basis in host family/school building as per available on arrival ( on cot with mattress/on floor with mattress, 4-30 volunteers in one room) shared accommodation (normally male & female separate room). You will get accommodation till 6 pm on the last day of your camp.We are unable to provide you any accommodation before or after these dates. Please arrange your own accommodation in case of early arrival or late departure .You are requested to meet our representative at the meeting place on exact time given above. If you arrive early then you can have your stay in any of the different hotels available nearby Airport, within 2 -3 km .on the road popularly called as V.I.P road. You are requested to take any cab to check in any of these hotels. If you arrive at earlier night then you are requested to stay inside the airport terminal and meet at the next morning with our representative at 12 noon. 24/7 Wi-Fi connection at accommodation. Food: You will get 3 times local veg food from host family as per available on arrival. Please do not expect any kind of special dishes (veg/non veg) or cold drinks or special living room or air conditioned room during your term. You are requested to get ready for a simple and challenging life. *Bishnupur ( ancient Bengali history, tera cotta ( clay made item ) ,sari etc. Any of these places can be covered during weekends by train by self organise !! * weekends exciting city ( kolkata ) and around trip can also be organised against extra cost. We need energetic your volunteer with open mind and ready to get their hand dirty. You need to be strong and flexible. India is a beautiful country but challenging for some people . Local culture,people are interesting but weather is hot and humid in summer ,so get ready to explore an amazing country with full of surprises. *Parents permission letter if you are below 18 years. – for women, bring conservative clothing that covers the shoulders (ex: shirts with capped sleeves) NO shorts, bikinis, sleeveless clothes outside your own bed room (strictly). Meeting Point: At 12 noon outside the Kolkata (international terminal gate 4A) airport arrival gate. Or as per arrival details. pickup available between 6am-6pm only( subject prior confirmation). Transportation : You will have to use the local available public transportation ( Train/Bus) the camp during your term. Airport pickup would be available only.Airport transfer on last day of the camp would volunteers’ responsibility . Full Member of CCIVS ,Associate Member of NVDA , Hosting partner of many Alliance Members and other IVS network round the world.